One of the basic ingredients for a healthy, prolonged life in the modern age is access to energy. We rely on energy to heat and cool our homes, to keep us in light, and even to power our cars in terms of gas at the pump. But the trouble is, the techniques and processes used to generate energy today are often bad for the environment, and they are depleting precious natural resources while pushing up carbon dioxide emissions in the process. Globally, the energy mix is still one that is dependent on fossil fuels, and studies are showing these are expected to run out within a few short decades. Things like oil and coal power stations are able to generate reliable energy. But the problem becomes worse when you consider the relative environmental harm these methods of energy generation cause. As these finite fuel sources continue to be consumed, with rising demand from the growing economies of the east, we could be facing a global energy challenge unless we embrace new, sustainable alternatives. Perhaps the biggest single development to hit the global energy market in recent decades has been the discovery of fracking for shale gas, now a huge and growing sector of the US energy market. While shale gas is essentially another fossil fuel to gradually deplete over time, there is a need for policy makers and energy companies to secure reliable energy sources, even at the potential expense of the environment. Nuclear exists, but the risks of Fukushima-style leakages and fall-out make this a dangerous option long-term. Instead, truly sustainable, organic forms of energy need to be maximized if the US is ever to become wholly self-sufficient and environment-neutral. There are some extremely popular options that provide for much greener power, and some analysts are suggesting the true solution to the global energy dilemma lies with a mix of different types of these sustainable sources. Solar power could grow to be a big one for US energy needs. Vast photovoltaic farms already exist, which capture the heat from sunlight, before harnessing that power to provide energy for consumer and business consumption. Surface area is the main issue with solar power at this stage, and as cells become ever more compact, they will operate much more efficiently space-wise. The real growth for solar power may need to come from greater domestic uptake, with homeowners choosing to install their own panels to save costs and keep off the environmentalists. Rooftops capture a potential gold-mine of energy resources which currently go to waste. Yet virtually every home in the country could use a couple of solar panels, to generate their own power and to save money on the cost of their energy bills. 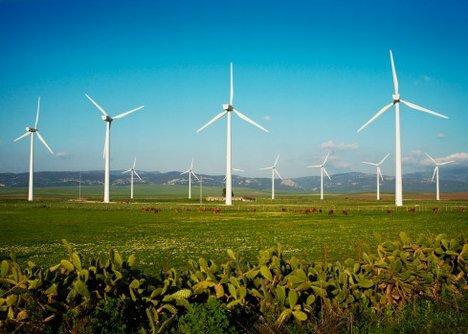 Another form of alternative energy that has found favor among policy makers across the world is wind power. Wind power is the ultimate free resource, and both on and offshore examples already contribute to the total overall energy mix. When the wind blows, it catches the blades of a specially designed turbine, which in turn propels a generator inside the structure. This is then transported to the grid, where it is usually resold. The difficulty is, however, that there is not always enough wind to generate much energy from each turbine, and they often cost a great deal of money and a lot of time in the planning and construction phases. While wind power has its critics, there is also research ongoing into sea, or wave power, where the motion of waves is used to generate energy. Unlike wind, the sea is much more predictable, with to-the-minute projections of tides that ebb and flow much more accurate than any forecast about the wind. The trouble with sea power is that it remains an expensive, cumbersome technology, and it is still some way from being functional enough to be commercially viable. In order to solve these challenges, we need a new generation of highly skilled engineers, with the training and expertise to find solutions to the world’s energy needs long term. Engineering jobs in Kansas City are essential for the industry, given the talent that still exists in the region, and it is important policymakers go as far as possible to encourage these technologies to be developed. We may not see the effects of environmental damage now, but we will definitely feel the lack of fossil fuels when they dry up. On both these grounds, it is essential for the energy security of the world that governments, universities and the private sector work together to devise a workable alternative plan.